Ask fellow campers about "Heyburn Riverside RV Park" and nearby attractions. Question: What are your weekly daily and monthly rates? Answer: Dunno. Rates aren't published on their website, either. Looks like you have to call. What a gem. I hesitated to review it because it will become popular. This is a town operated RV park right on the Snake River. Wide roads, easy in-out, no obstructions and only four other campers in mid-November. The park closes for the winter Dec. 1 - roughly March 15 depending on the weather. No park host on duty at this time of year. Payment also seems to be on the honor system. Cash or checks only. $26 for seniors, less 10% Good Sam discount is a real bargain. The back in sites are easily large enough for big rigs, but the pull-thru sites are not. We had to disconnect and park the car next to the coach, but we are close to 65' hooked up. Watch the curbs, but otherwise no issues. The RV park is part of an extensive riverside complex that is a pleasure to walk and a great place for the dogs, too. The only downside is the odor from some large industrial plant not far away. When the wind is wrong the smell is a little .... strong. We camped at Heyburn Riverside RV Park in a Motorhome. This park is owned by the city. It is situated in the town, but a rural park on the Snake River, which you can walk along from the park. It is incredible value at $25. Extremely long pull through's, with additional space to park 2-3 cars/trucks. Wide grass lawns separate each site. Wide entry roads and easy access, a mile off the interstate. We camped at Heyburn Riverside RV Park in a Motorhome. Beautiful city owned RV Park. Easy to get to and no problem maneuvering our 45' MH with tow through the park. Sites paved with curbs so be careful leveling with your basement door openings. Did not impact us though we were close! Camp Hosts were very friendly. Walkability is superb with lush grass, beautiful landscaping and pathway along the river. We would go back here. Satellite hooked up with strong Verizon. They do not take credit cards. We camped at Heyburn Riverside RV Park in a Motorhome. This is a beautiful little park right along the Snake River. Flat level pull-through spaces. 10% Good Sam Discount. FHU with 50 amps, a concrete patio with picnic table and grill. There was good separation between sites. The park WiFi worked well. There was a little road noise during the day, but the park was quiet during the night. The park has a very nice walking trail along the Snake River. This is a city park and very well taken care of. Stayed three nights and would stay here again. We camped at Heyburn Riverside RV Park in a Motorhome. We stayed here for the first time for one night on our way to Washington. As others have stated, this is a city owned park and is very well maintained. We had barely pulled up to the host site to check in and were immediately greeted by the host who quickly checked us in (we had a reservation). One caution he told us was to not give the restroom code to anyone or let anyone into the restrooms. He said that park users and people who swim in the river are not to use the RV parks facilities. Our site was gravel but very level. It was not long enough for my RV and towed vehicle but included a large gravel parking area for the vehicle. The site had a large concrete patio, a picnic table and a barbecue. Water pressure was good as was the electric. The only reason I did not give the park a perfect 10 was because of the placement of the water hook up and the narrowness of the site. The water connection was right in the middle of a very large evergreen bush. The site had a concrete curb on the drivers side which made if very difficult to access the utility basement doors on that side. That coupled with the large bush being the way made it very difficult to make all the connections. We stayed here in a motorhome - towing. We camped at Heyburn Riverside RV Park in a Motorhome. 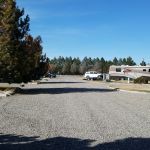 This is a super clean RV park, but the RV park (as I understand it) is in conjunction with the City of Hayburn Park next door, and obviously shares the Restrooms and Shower facilities with the City and anyone who happens into the park can use them, which in my mind is NOT SAFE. The 'Park Attendant', and his wife are extremely friendly. They clean and keep the RV park and its beautiful grass, as clean as a whistle. But, being as it is in conjunction with the city, you just cannot beat the pricing. We camped at Heyburn Riverside RV Park in a Motorhome. We were here for one night on our way to Yellowstone. The camp host came up to our truck as soon as we arrived. He checked us in (cash or check only), told us the few rules and suggested a few things we could do for fun. Our site was level and clean. The tree on our site gave some afternoon shade. The park seemed very well maintained and quiet. Although this is a no-frills park, I would definitely stay here again if I were passing through. 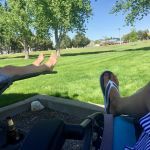 We camped at Heyburn Riverside RV Park in a Travel Trailer. Take a walk down by the Snake River which is about 100 yds away. Have a picnic at the (county?) park adjacent to the campground. The park is well kept. Lots are large and have some grass between them. The park is very near the river, so you can easily walk over and use the hiking trails. Park host was professional and courteous. Easy location to get off and on the highway, but traffic noise was minimal. We camped at Heyburn Riverside RV Park in a Fifth Wheel. A gem. 5 minute easy drive off the interstate. Extremely well maintained. Lots of grass and trees for kids and dogs to run. 100 yards from the river. A bit tight but we were able to maneuver a 42 footer with a dinghy and did not unhitch overnight. Just a cute quant great little park. We camped at Heyburn Riverside RV Park in a Motorhome. Very nice city park adjacent to the Snake River. Sites are spacious and level with grassy area between spaces. All utilities are conveniently located and function appropriately. If you are 'noise sensitive' be aware that there are occasional low-flying aircraft, considerable traffic from the nearby highway, and watercraft on the nearby river. The park is immaculately maintained including very attractive landscaping. We camped at Heyburn Riverside RV Park in a Fifth Wheel. Lots of attractive paved walking trails along the river. We received a $1.00 discount for staying more than one night, another $1.00 senior discount, and then a 10% Good Sam Discount. The site was level, gravel, pull-in, FHU with 50 amps, with a concrete patio with picnic table and grill. There was good separation between sites. We had good Verizon cell and internet reception. The park WiFi worked well. We had good DishTV satellite reception. There was road noise during the day, but the park was quiet during the night. The park had a very nice walking trail along the Snake River. This is a city park that is near a school and a cemetery. We would stay here again. We camped at Heyburn Riverside RV Park in a Motorhome. This park was a pleasant little find. It has Full hookups, Wi-Fi, gravel roads and sites. Concrete curbs define the spacious, open sites and contain the grass. This is a beautiful park with a walking trail along the Snake River. We camped at Heyburn Riverside RV Park in a Motorhome. This is a lovely city RV park with a mix of back in and pull through sites. Sites are long and wide with plenty of room between neighbors. Road ways are paved; sites are gravel. There's a concrete patio area with picnic table and BBQ grill and plenty of room to park an unhitched tow. Restrooms are located in the City Park area to the front of the RV park. There's a children's play area located there as well. A walking trail takes you along the river and into the local arboretum. The camp host will provide the WiFi password and code for the bathroom/shower. We will definitely stay here again. We camped at Heyburn Riverside RV Park in a Motorhome. The Chamber of Commerce Visitor Center is located in the City Park and has lots of good information and gift merchandise. For geocachers, there are two caches within the City Park area. Visit Gossner's Magic Valley Chalet, the local cheese factory located across the street from the park. It is within walking distance. We have stayed here several times as it is a good first/last night out. It is fairly quiet with a nice little walking trail on the river. We have not been when there is a "camp host" before. There was a sign to see the host, but no host around. We saw a few cones parked at sites and assumed they were taken, so pulled into an open site. After set up I went back to the pay kiosk and the host was there. He seemed confused (thought we came in the night before). I told him our site and was informed by his wife we had to move, the site was reserved! She was not willing to exchange sites because we were in a long-term site (they were exactly the same). Later the park manager came over and apologized. The host rode around in his cart (with the marker cones in the back) and escorted folks to their sites when he noticed their arrival. We will be back, because the park and management are great. 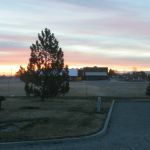 We camped at Heyburn Riverside RV Park in a Fifth Wheel. We stayed here one night on our way south. Camp host was very helpful over the phone, said we did not need to give any credit cards and he would hold a spot for us. Very windy when we got there...30mph...so we could not enjoy the park or the river walk as much as we would've liked but it was a terrific add on next to the park. Our site was just long enough for our 40' and trailer. Water pressure was fine. We did not hook up sewer as it was way at the back and I did not want to hook up multiple black hoses. Easy in and out. Self registration. We got senior and good sam discounts. Lots of grass between sites. We would like to come back and stay a couple of days to enjoy the river scenery. 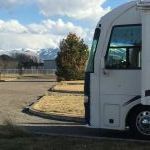 We camped at Heyburn Riverside RV Park in a Motorhome. Take the river walk. It's beautiful and peaceful. They have dozens of full grown trees that are all marked as to what tree they are. Restaurants, Golf Course, Auto dealers, competitive fuel stations, across the river in Burley. Cheese factory across the highway from the RV park. Low flying aircraft into the airport on the Burley side of the river, flight path right over the campground. Did not have time to explore the area or take the hike from the RV park to the river. Next time! There is an elementary school right next door which is almost completely fenced in, which allows you to let your dog off leash to stretch its legs. We had lunch at the very big and busy El Caporal in Burley (1.6 miles away). Hubby had a combo plate and I had the Arroz Con Pollo and both thought they were excellent. Service was excellent too despite being a very busy place. Try the restaurants rated highly by Trip Advisor. The ones that we tried deserve the high scores. There is a dairy store diagonally across the street with good cheeses and really good ice cream. The Snake River is right there - lots of outdoor activities and the mountain to explore. A lot to see in the area including the Minodoka National Wildlife Refuge where was saw a number of magnificent White Pelicans. Cross the Snake River to play golf at River's Edge directly across from the campground. Maverick or Smith's for diesel fuel. Hansen GMC/Chevrolet for service. There is an Albertson's just down Hwy 30 in Burley, and a Shell station a little further down (opposite High Desert Milk) that was $.16 cheaper per gallon than the ones in town. Across Hwy 30 from the park is the Magic Valley Chalet, which has great prices on cheese and honey, among other things. Walk the Arboretum trail along the Snake River. Visit the Gossner's Magic Valley Chalet across the street - lots of locally produced jams, cheeses etc; also fresh dairy and a small restaurant upstairs. Check out Aguila Con El Taco for some great Mexican at a great price! City of Rocks National Reserve is a nice day trip from this park. Lake Walcott State Park is a nearby trip as well, with some decent birding. If you have time to drive around, take Hwy. 30 towards Twin Falls to see hundreds of thousands of acres of scenic wheat, alfalfa, sugar beets, beans and other crops that are being irrigated by an intricate system of canals from the Snake River. We also enjoyed the drive to the City of Rocks. Good food at Upper Crust Bistro right across the street, also has a cheese shop and ice cream parlor on the lower level. It's a short walk to the Snake River and arboretum. Everything you need is right down the street. Heyburn is a very small town, but close to outdoor activities, especially if you are a rock climber. The Nat'l. Park Reserve, "City of Rocks", is close by. With a very complete tourist center next door, one can get a lot of detailed information. Our stay was only for overnight. Wide variety of shopping, golf courses, and boating in Burly, less than 3 miles away. Try Duck Ugly's and enjoy the music on the weekends. Smith's Grocery nearby, in Burley, fuel there is cheapest. Golf at the River's Edge, Burley, nice 18 hole par 72, directly across the river from CG. Nice place to just kick back and relax. City of Rocks Back Country By-Way, Castle Rock State Park, Shoshone Falls, Evil Knievel jump site, a lot of nature and history in the area. Drive thru small town historic districts. Morey's Steakhouse in town is excellent. A great cheese factory right across the street from the park. Unavailable 1/2 pound burgers. Visit City of Rocks National Reserve. See where pioneers camped on the Oregon Trail. Look for the local fruit/vegetable stands and stock up on your fresh foods. The cheese outlet across the street also has some good deals. Are you affiliated with Heyburn Riverside RV Park ?